Barbie فلمیں. Do آپ think this is a nice تصویر for our club profile???. 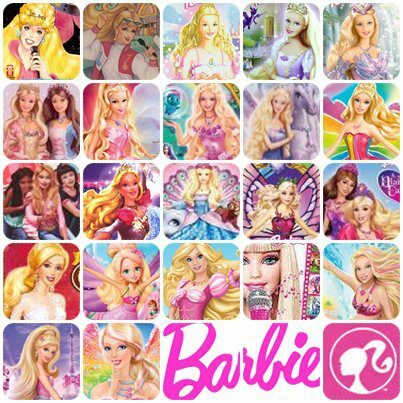 Wallpaper and background images in the Barbie فلمیں club tagged: barbie movies. Do آپ think this is a nice تصویر for our club profile??? This Barbie فلمیں fan art might contain ڈاؤن لوڈ ہونے والے, مزاحیہ کتاب, منگا, کارٹون, ہالی ووڈ, and کامک بُک. they missed out 3 movies :/. The third original Barbie 'movie' 'Dance Workout' and also Barbie Charm school and the latest Xmas one. I think our current icon works just fine. (I personally don't like icons that consist of a dozen of smaller ones), but this one is very well done. Good job. Wait! Is that Sing Along with Barbie??? ^Yep, it is. Is something wrong?